This is the last post in the series and it focuses on something dear to my heart. Gardening. My garden, is place of joy and tranquility. When I spend time working in my garden, I instantly relax and forget about the worries of the world. I feel connected with what I am doing at that very time and place. The simple act of planting new seeds or seedlings and watching them grow in the following weeks, fills my heart with a warm glow. When one of my hand raised seedlings die, a little bit of me goes with it, but when they thrive, I feel strong and filled with a sense of accomplishment. It is the best feeling to be able to walk out to the veggie patch and harvest the ingredients for a summer salad or meal, safe in the knowledge that you are reducing your food miles and therefore, your carbon footprint. So here are today’s tips about reducing your water usage in the garden and decreasing your carbon footprint. Using water wisely cuts your overall water usage by up to 50%. Mulch is a wonderful tool to have in your gardening armoury. It keeps the moisture in the soil, keeps the soil cool in summer and warm in winter. Think of it as a big blanket for you garden beds. They also keep weed growth down. A great book on the subject is "The Miracle of Mulch" by Mary Horsfall, which describe the types of mulch and its many uses. Simple things are also effective for saving water. Checking the weather forecast for possible rain in your area before venturing out to water the garden. Check how damp the soil is before watering. The mulch may look dry, but by looking underneath the soil is most probably moist enough and could last another day. Wicking beds or wicking boxes are a great idea. They water the plants from the bottom up with a constant supply of water near the root zone. Hardly any water is lost to evaporation. Have a look at this video to get a better understanding of the technique. I will be giving them a go in the next few weeks. The principle looks simple enough. Here is another water saving tip I received from Kate over at Hills & Plains Seedsavers. I think she called it a wicking pot. I tried it out last weekend, with some amazing results. 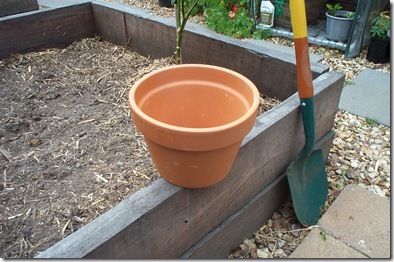 What you do is lay your hands on some terracotta pots that are unglazed and unsealed. Then you plug up the hole in the bottom with silicone (I used a rock and some silicon to stop the water from leaking out. Then you bury the pot into your prepared garden bed up to the lip leaving about 2 cm above the ground to allow for the mulch. Then you plant you water loving plants around the pot. Veggies like lettuce, celery that need a lot of water are a good idea. 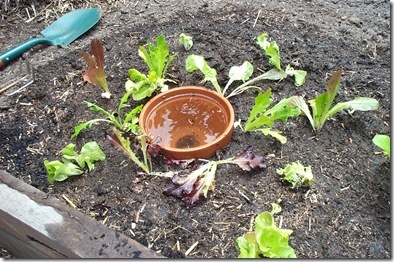 In this example, I planted lettuce. They look a bit sorry for themselves as it was a hot day, but they soon recovered. 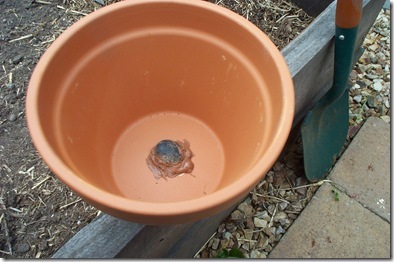 Water the plants in well and fill up the pot to the top and bung on a lid to prevent evaporation. 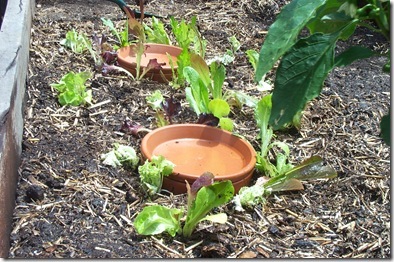 Then mulch well around the plants and the pots to keep the moisture in. Since I planted last Saturday, I have filled the pots twice with water. All of the lettuces survived the transplant and have new growth. 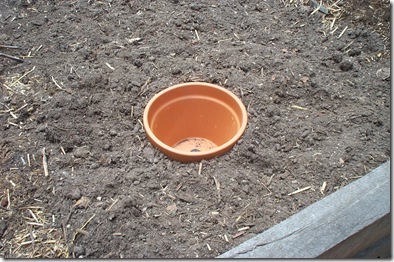 The pots structure lets the water seep out slowly, therefore keeping the soil moist at all times. I find that it takes about 3 days for the pot to drain completely, and the soil around the pot out to about 20cm is damp to touch. Fantastic tip, thanks Kate! Kate used this method last year, and found that she could pick the lettuce during the heat of the midday sun, and found that the leaves were still nice and crisp. Other great and easy ideas are reusing your greywater for watering fruit trees and non-root and leafy vegetables. As long as the greywater doesn’t come in contact with the edible part of the plant, you should be fine. Watermelons love greywater, as do most cucurbits. 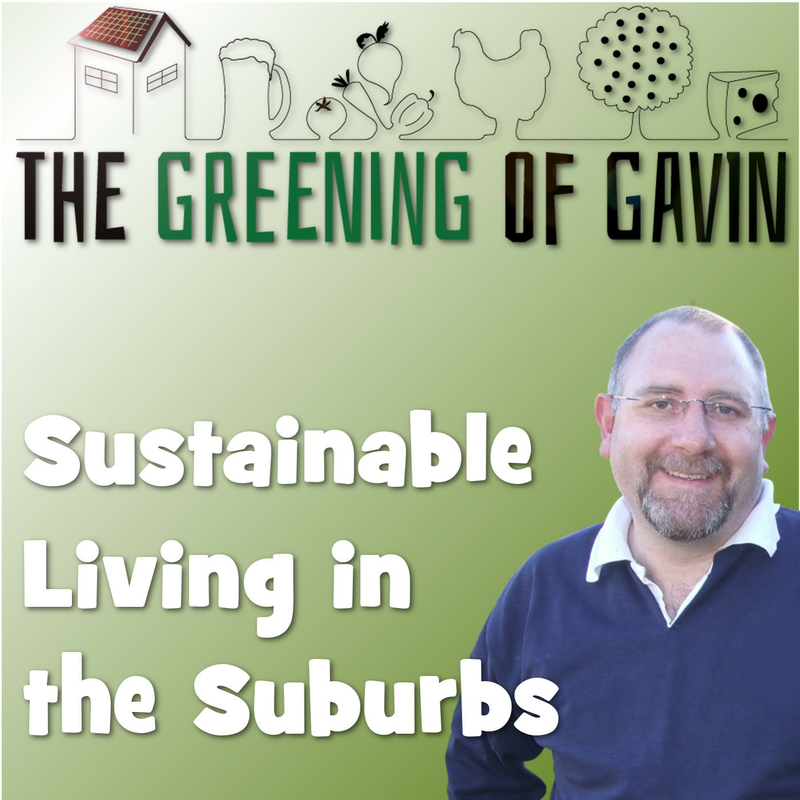 Make sure you wash the produce well when picking after having used greywater just to be sure. If you do decide to use greywater, ensure that you use an plant friendly laundry detergent with low sodium and phosphorous content. 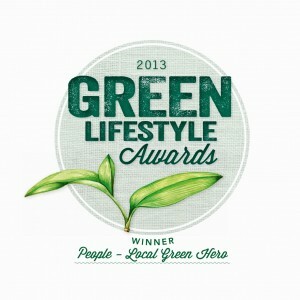 We use Planet Ark Aware laundry powder, and the plants love it. If you have the space and the funds, a rainwater tank is a must. Even though I only have a 2300L tank, it saved my veggie patch last summer. By only being able to use mains water twice a week, the ground dries out very quickly when the temperature get over 35 degrees C and the rainwater is a godsend. Cultivating less lawn and more garden reduces garden water usage by 40%. When I see a well groomed lawn covering an entire front yard, I see wasted energy, time, and money. Last time I looked you can’t eat a lawn. I will give you that kids can play on lawns but for all the effort to maintain them, it is easier to take them down the park for a frolic. Plant vegetables where the lawn is. Not only do you use far less water, but you get a tangible benefit out of your effort in the form of food. Front yard vegetable patches are the new black! Gone are the days of the lush lawn and all the petrol required to mow it. So by not having to use fuel, or artificial fertilizer you can drastically reduce your carbon footprint by converting that antiquated lawn to vegetable production. Planting native Australian species reduces garden water usage by another 20%. I dig native plants. I have a few that require absolutely no watering at all. After all, this is the climate they survive in so it comes naturally to these plants to last a long time in prolonged droughts. I have been trying to get my hands on some local bush tucker plants other than the Lilly pillies that I already have, but the knowledge at the nurseries around here is lacking. All I got were stupid looks when I asked the other day. I will have to do a bit of research to see what will survive around here and that is edible. Wish me luck. Well, sad but true, but today is the final day of Zero Footprint Week. I hope you all enjoyed the series as much as I did writing it, and I would like to thank the team at One at a Time Foundation for contacting me, in particular Dan, and letting me run with the idea. 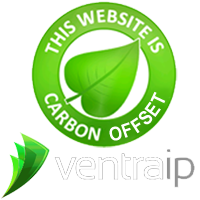 I hope all of the tips have been helpful and all I ask is that you have a think some of them, and try and make a difference to your carbon footprint in your part of the world. fantastic hint about the teracotta pots. Will be doing that for sure. good idea with the foam boxes ill have to get a couple and try it ,as i only have limited space.and congratulations on your writings for the week. Yes, I liked the terracotta pot idea too! Now, where to get some cheap pots?? Glad you are trying the clay pot idea. 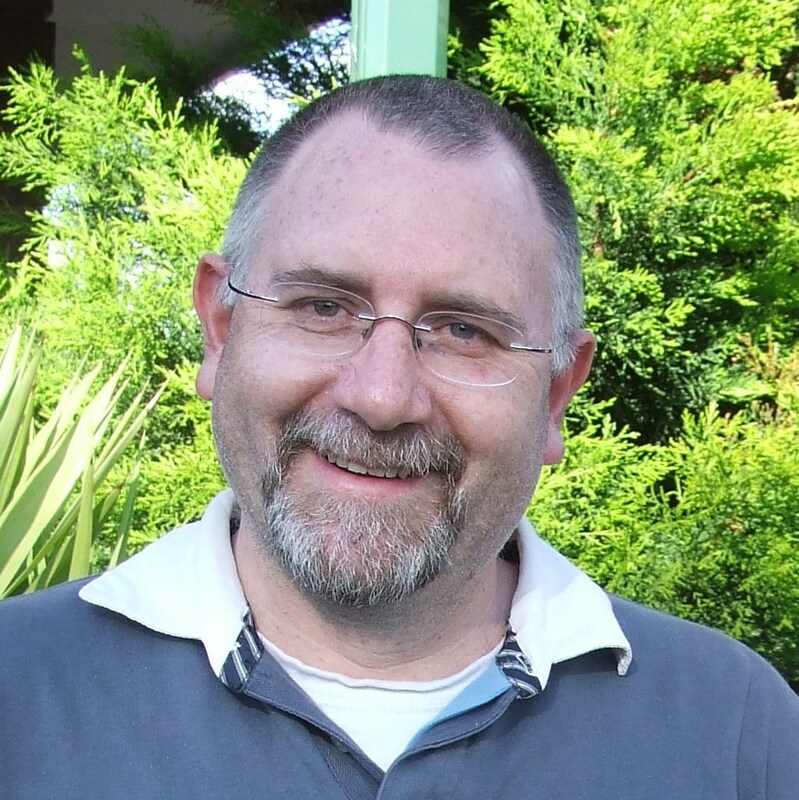 I think it is great for several reasons…and I am about to write another post on it as I have just installed a whole row of them for this summer….stay tuned!